Joaquín Torres-Garcia, "Grafosicion Constructive", 1931. MADRID.- With inspiration stemming from Javier Lumbreras long standing passion for fine art and strong track record of investing within the industry, fine art since 1988. Their credo is that success in the fine art market depends on accumulated qualitative and quantitative methods, global market arbitrage combined with the ability to identify, interpret and capitalize on specific art transaction opportunities. They also posses multinational expertise in the areas of logistics, safekeeping, restoration, cataloguing, conservation, taxation and duties giving them an all encompassing handle of the art market from every angle. To achieve the best returns possible for investors, AGF follows strict guidelines when pursuing artwork as to not be distracted by the aesthetics of any beautiful painting. 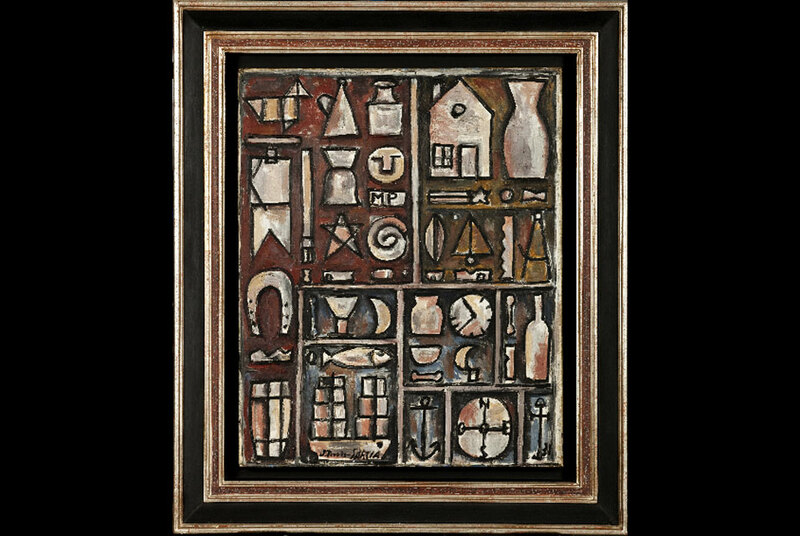 The strategically diversified portfolio and asset allocation includes pieces by universally recognized artists from superior genres such as Old Masters, Impressionism & Modern, Modern Latin American and Post-War and Contemporary art from recognized as well as emerging markets with global appeal. They go after small gems with notable iconography and compositions in the range of $250,000 to several million dollars in order for these valuable pieces to over perform as investments. The focus is quite narrow, emphasizing on classical media like oil and acrylics with a minor component of sculpture and embracing mixed media and photography for the Contemporary collection. AGF also provides what may well be a first in the art investment industry. The fund is dedicated to their philosophy of having their works of art enjoyed by the investors rather than hiding away in vaults and warehouses. Therefore, their policy is to enable investors to display works of art from the fund in their homes or offices on a revolving basis, similar to their investment level. Additionally, they provide investors with the opportunity to learn more about the art of collecting art through lectures, newsletters, art market updates and insight acquired over many years. The Artemundi Global Fund has recently been presented to interested investors all over the world. CEO Javier Lumbreras and Marking Manager & Fund Placement Liaison Laura Sheridan have traveled and spoken to audiences in Geneva, Mexico City, Milan, Montreux, Madrid and Miami. Whether at an intimate one to one presentation with a pre-qualified investor or in front of a several hundred person audience at a presentation by Banamex, CitiBanks largest bank in Latin America, AGF has been receiving tremendous feedback within their initial months of operation. Their investor base is an eclectic range of individuals and organizations. They span the spectrum from High Net Worth Individuals to family offices all over the world; from passionate art collectors to Institutions who are looking to diversify their asset allocation and place some of their portfolio in a real and tangible asset generally uncorrelated to other markets or inflation. They welcome art aficionados and new comers alike looking to benefit from the returns of this thought out investment strategy and hang world renown paintings in their homes. Minimum investment into the fund is a $250,000 USD unit for individuals which can be split between investors, $1,000,000 USD for institutions or family offices and $10,000,000 USD for Strategic Investors. Strategic Investors have the unique opportunity to be included in on the inner circles of buying methodology, learning the techniques and enjoying the hunt of capturing a masterpiece along side the fifth generation art collector from Spain. With representative outposts in Madrid, Miami and Mexico City, Artemundi Global Fund is a Cayman Island based and run investment fund with potential for $150,000,000 - $225,000,000 in funding to facilitate the goal of 150-200 exceptional works of art. AGF is a 5 year closed end fund that will begin to pay dividends to investors after year 3. They work with a team of credible, reputable and independent companies to keep the process professional and transparent. Administration and custody is run by Alter Domus, that manages 23 of the top 50 private equity firms in the world, KPMG works as fund auditors and Lloyds Underwriters of London, one of the most recognized art insurance agencies in the world, coordinates the funds insurance. The legal team includes Walkers Corporate Services Limited, SM&GQ LLP and K&LGates LLP. AGFs management, Artemundi Management, provides exceptional knowledge and vast experience as art collectors, having invested more than $250 million in fine art since 1988. Their credo is that success in the fine art market depends on accumulated qualitative and quantitative methods, global market arbitrage combined with the ability to identify, interpret and capitalize on specific art transaction opportunities. They also posses multinational expertise in the areas of logistics, safekeeping, restoration, cataloguing, conservation, taxation and duties giving them an all encompassing handle of the art market from every angle. As active traders in many different forms of art deriving from many significant periods, Artemundi Management has a unique and ongoing perspective of the art market, ever mindful of changing tastes and tendencies. They constantly monitor their strategies to assure they are on course, so as to validate that they are indeed choosing the right works at the right time and at the right prices while contributing to the Funds expected return. Simultaneously, AGF makes the auditing of the fund easier and more transparent, as at any point in time, both the administrator and the auditor can more precisely assess the real value of the portfolio and produce timely and accurate reports for investors. Furthermore, through active management, Artemundi Global Fund generates the necessary liquidity required to take optimum advantage of unique opportunities that come their way.